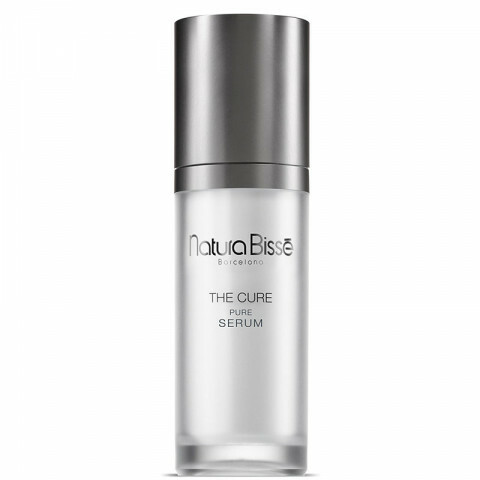 The Cure Pure Serum is a sophisticated, exclusive and highly rejuvenating concentrate that combines revolutionary cosmetic ingredients to detoxify and repair damaged cells and elevate the levels of skin hydration from within. This exceptional formula contains SIRT-AP, a cutting-edge and advanced peptide complex obtained from Soy and the Oryza Sativa rice that modulates the activity of Sirtuin 1 and Sirtuin 3 which prolong the lifespan of cells, repair the damaged cells and protect them from oxidation. SIRT-AP reduces the levels of aging biomarkers such as the p-16 protein and prolongs the skin's youthful appearance. Apply daily on thoroughly cleanser face, neck and décolleté and gently massage in until completely absorbed. Follow by applying appropriate treatment by NATURA BISSé. instantly rejuvenates my skin, leaving it smooth and soft.